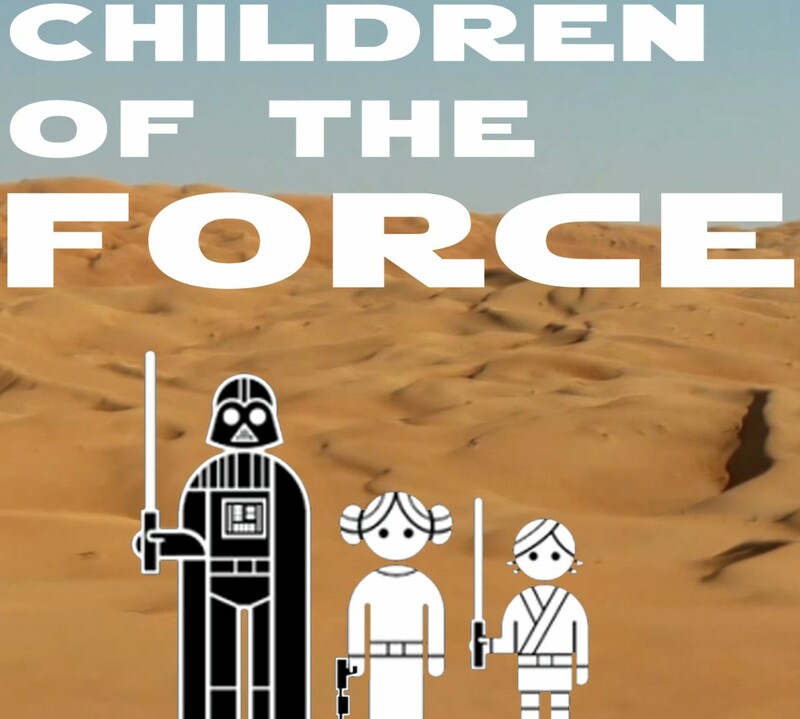 In episode 12 of Children of the Force, we discuss the news that dropped over the last week or so, including all the goodies in Entertainment Weekly and everything that came out of the Disney convention, D23. First up, and I think possibly the biggest news out of the convention, is that Colin Trevorrow is directing Episode VIII. We discuss what that might mean for Rey’s ovaries. OK, not really. But considering Jurassic World, it wouldn’t surprise me. J.J. Abrams: Old meets new and awesome (Star Trek, Super 8). He’s got that sort of old Hollywood meets new tech vibe, which A New Hope has, as well. Rian Johnson: Moody, edgy, sad endings (Looper, Brick). His movies are great, but ultimately, they’re downers. The Empire Strikes Back is awesome, fun, but ultimately, sort of depressing. Colin Trevorrow: Blockbuster / give ’em what they want (Jurassic World). If Jurassic World is any indication, he’s got the sort of whiz-bang mentality and blockbuster acumen that harkens back to the rollicking fun of Return of the Jedi. These aren’t perfect comparisons, of course, and who knows what the directors will do with these sequel movies. But it’s something fun to think about. Next, I reveal that sweet Drew Struzan poster to the kids and they freak out. We talk about basically everything that this slashfilm article points out …. but before I ever read that article. Great Star Wars minds think alike, they say. 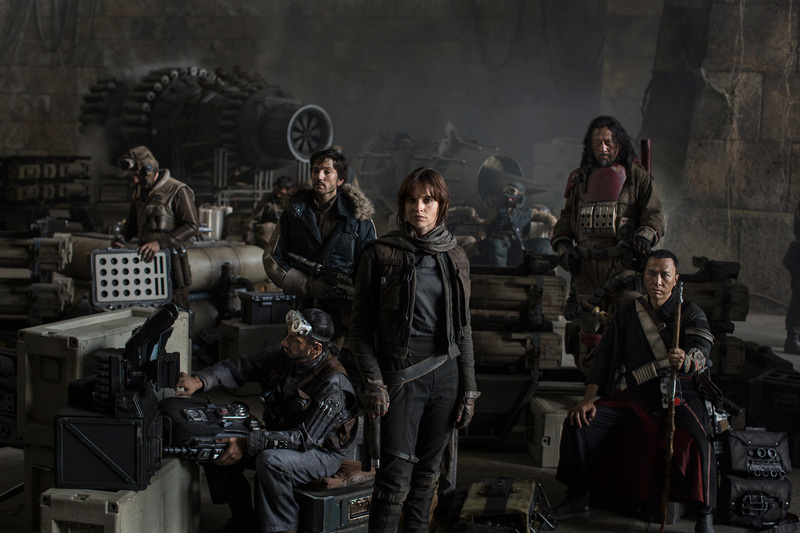 And as if that wasn’t enough, we also got this stunning Rogue One image. The kids like this, but they don’t think it looks all that much like Star Wars. Related to our discussion last week, we discuss how we Rogue One will be like the prequels: we know how it’s going to end. How does it get there? That will be the fun part. And how about this Kathleen Kennedy quote from D23? Ground war, huh? So …. no Rogue Squadron? This isn’t a movie about X-Wing pilots? Calling the movie Rogue One was actually an epic trolling of fandom? All right, then. So that was D23. Or at least some highlights. Then we move on to discussing all the information out of Entertainment Weekly. Click this link to see all those sweet photos we talk about. 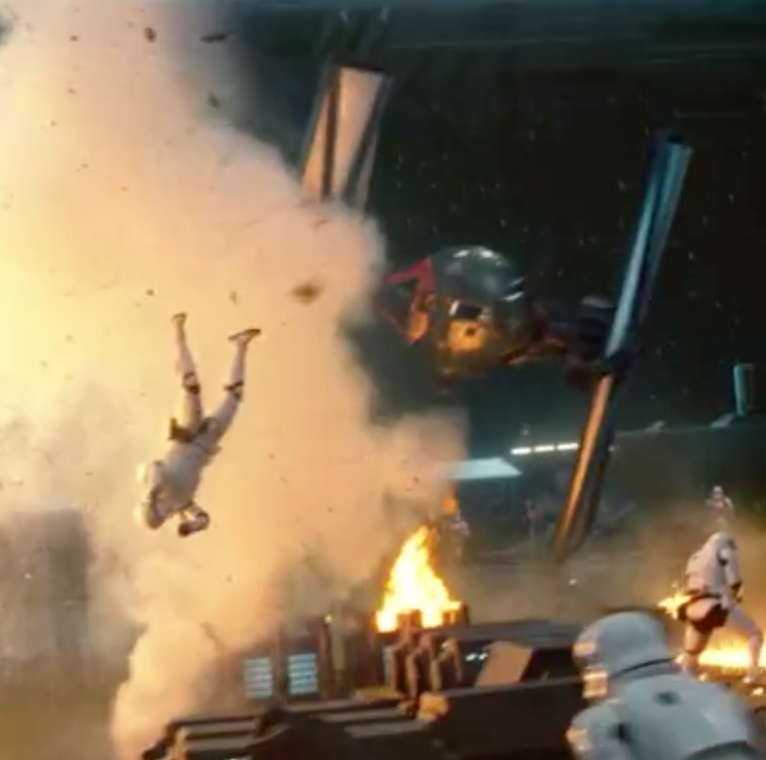 That’s a two-seater TIE Fighter. 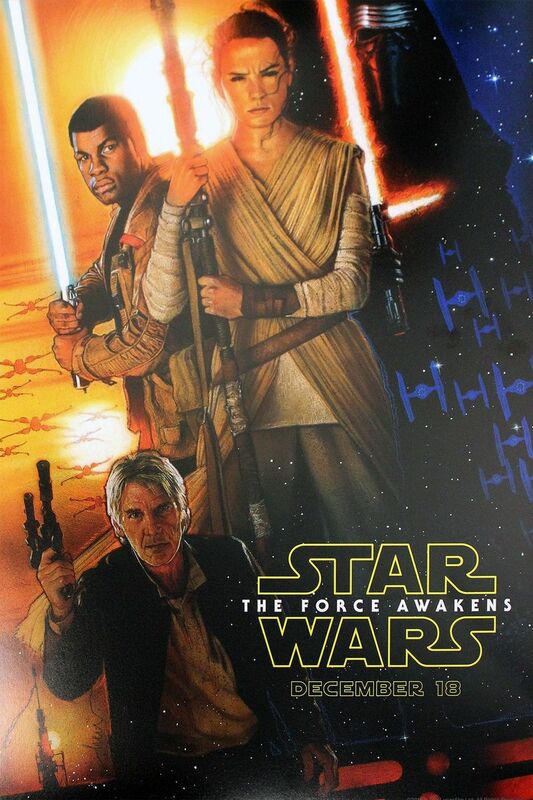 Thanks to this image, we know that the TIE we see shooting up the place in the second TFA teaser is facing away from the camera. So what we’re seeing is the back. And it’s gunnin’. Hence, rear gunner. In response to that quote, I wax all philosophical-like about how glad I am that Abrams said it, but that soon it won’t be all that true. I use a quote about a broom from the Dr. Who episode, Deep Breath. It’s a variation of Theseus’ paradox, which is basically the same thing, but with a ship instead of a broom. To wit, if you start with a thing and replace every part of the thing over time, is that thing still the thing you started with? What I hope happens is that George’s ship is slowly and carefully turned into Lucasfilm’s ship and that the change is so gradual and well-done and it continues to sail so true that we won’t even really notice the change. I’m skipping over a lot of what we talk about in this episode. There’s just so much news. But one more thing. To which I replied: Huh. Could the Knights of Ren be a group Offee started? We don’t know her fate after The Clone Wars. 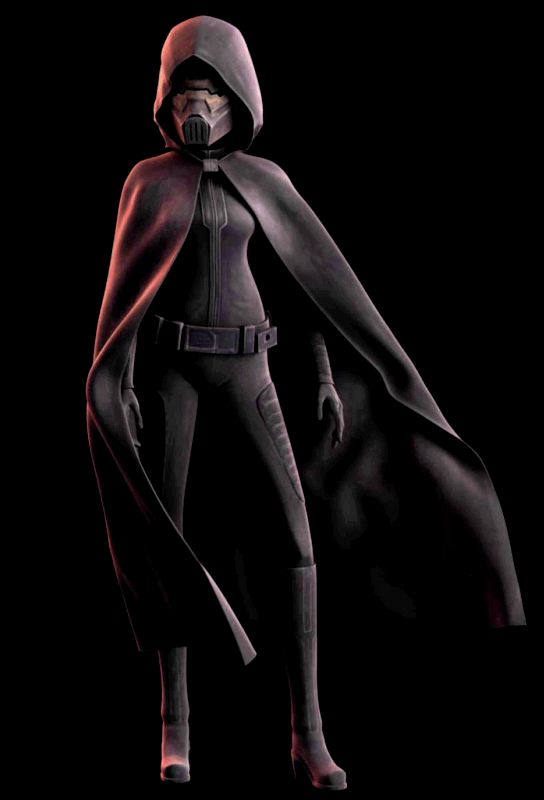 Could she have escaped the Empire and started a new order of Jedi? One that didn’t call themselves Jedi? 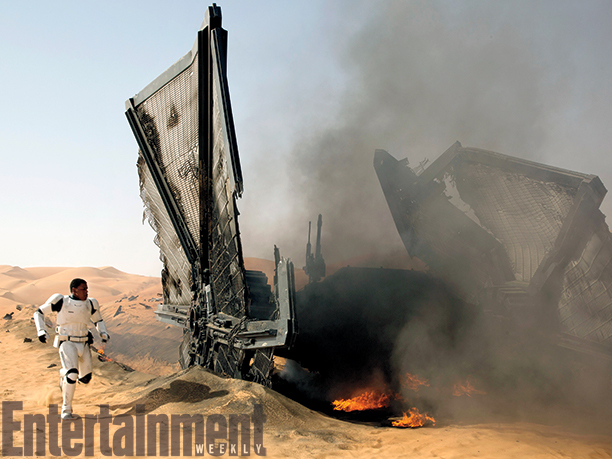 Could Kylo Ren’s parents have sent him there to learn the ways of the Force? Could he have betrayed the Knights of Ren once he learned what he needed to know?